I felt like I was putting everyone out with my broken ankle. I wanted to do everything myself. So I took forever to get places. I struggled to open doors on my own. I put on a fake smile when people asked me how I was doing. Yet here’s the thing. My body was recovering and in pain, so I got tired easily. I had to put all my weight on one leg for a long time because I refused to sit down. It wore out my body. I tried to act like I did when I had two functioning ankles (yet only one worked), so I got tired. It soon became clear that doing things my way, on my own, in the old way, did nothing to help my situation. I wasn’t productive or efficient or happy. I felt more useless than ever. As a person with Activator in my Top Five StrengthsFinder talents, this certainly wasn’t going to fly. I broke my ankle when I was working at a summer camp. I was on “work crew” which is a group of graduated high school seniors who do all the nitty-gritty hard labor during the summer. We cleaned bathrooms, made the meals, cleaned up after meals, etc. I broke my ankle so soon into the summer, I couldn’t bear the thought of leaving. Stubborn, stubborn, stubborn. My boss and friends all expressed their confidence that if anyone could be on work crew with a broken ankle, it would be me. I wanted to believe them. Yet I also believed I had to do everything on my own. I was scared to be broken because I like to be on the move. If Activator is in your Top Five, you’re probably impatient with inactivity, and love to get the ball rolling on whatever life throws at you. You are a catalyst for change. On the downside, you can also leap without looking, and can get caught up when you feel like you’re wasting time. I am a textbook definition of an Activator. For example, I love manual labor and workouts that make me sweat. I like being challenged and pushing through it. I like tangible results because I’m impatient. I like seeing and feeling progress, seeing and feeling that I am contributing. I like doing. I am driven by action, and feel useless when I am not moving something forward. When I first realized my ankle was super broken, and what that meant, I was mad and frustrated and scared. Mad because I didn’t want to be out of control or uncertain. Frustrated because I didn’t feel useful. Scared because not being useful meant I wasn’t doing my best as a leader or team member. I got caught up in the big idea that I was physically incapable of a lot of things. The raw Activator in me looked at my physical inability to take the next step. It made me feel as if I couldn’t. I tried to pretend it didn’t happen because I didn’t want anyone to see me as useless. In reality, I didn’t want to think I was useless. That kept me from seeing that a broken ankle isn’t a permanent occupation. At the time, I was not familiar with Strengths Finder, yet I was very familiar with the way I did things day-to-day. If I had known Activator was in my Top Five Talents at the time, it might not have changed my attitude immediately, but might have helped me realize that rarely do our strengths show up fully formed. It takes time and effort to learn about ourselves, and the world around us. We have to grow. I was used to relying on my Activator in a physical way, which gave me confidence. I didn’t realize it would shake me up so much to have partial physical ability taken away. Then I met my Destiny. Destiny came in the form of a camper with an amputated leg. 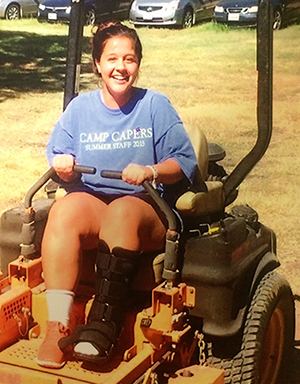 She got around on crutches and needed to be driven on the camp golf cart to keep up with her cabin’s activities. 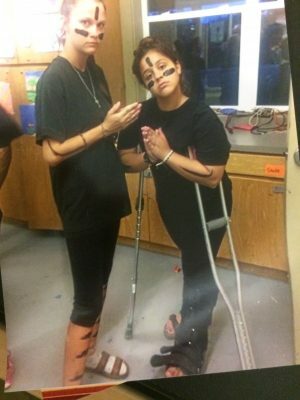 Destiny was having issues with her prosthetic leg, yet she came to camp anyway. She had to stick out six days in the heat of the Texas Hill country, on one leg. She couldn’t participate in a lot of the activities at camp. I couldn’t either, so I got to hang out with her. I drove her around on the golf cart to keep up with her day. Destiny was funny. She made sarcastic remarks and asked me questions. I made her laugh and enjoyed spending time with her. She didn’t complain about her leg. She was dealt a difficult hand, and she took it in stride. After a few days of helping her get around, I realized I had been the reason I felt useless. Albert Einstein said, “the definition of crazy is doing the same thing over and over again and expecting a different result.” I couldn’t keep trying to do my job the old way. No matter how impatient I felt, I wouldn’t be able to speed up the rate of my bone growth. In the beginning, I felt an obligation to my pride. It kept me from asking for help. After meeting Destiny, I felt an obligation to be the best me I could be, just like she was. When we hone our talents, and learn to use them, they benefit us and everyone around us. Just think of how much we bring to the table when we combine all of our talents, and realize we are 1 in 13 million (those are the chances that someone else has the same Top 5 StrengthsFinder talent themes in the same order as us). Natural Activators create momentum. They’re catalysts for motion, change, and progress in almost any situation. Not only do they bring energy, but they spread energy. A hunger for movement and progress is contagious. Natural activators don’t always know when their talent is at work, as it takes practice, mindfulness and patience to hone it into a strength. After hanging out with Destiny, I decided to embrace my broken ankle for what it was, something I would just have to deal with. Destiny made me her friend and taught me how to mature my Activator talent. I decided if I couldn’t do great big, physical things, I would do small things in a great way. I wanted to foster an attitude and mindset that would inspire others like Destiny inspired me. People always say actions speak louder than words. I believe our attitudes drive our actions. I wanted to have fun with a broken ankle and find ways to be useful despite it. I started with dishes. I didn’t like dishes, yet it was one of the jobs I could do that didn’t require too much physical effort. So I made it my station. Normally, one stands at the outside sink in the dining hall where kids dump their plates and cups and silverware to be rinsed and sent inside to the kitchen to be put in the dishwasher. But I needed to make it work. I stood on my right leg, with my left booted leg propped up on a chair and did the dishes in one spot, every meal. Dishes became my station. One of my favorite chores was mowing the lawn. One reason I loved it is that nobody ever asked girls on work crew to mow. I wanted to show everyone that not only could a girl mow, but she could do so with a broken ankle, and have fun doing it. I could sit down on the mower and drive all over camp, going fast or slow, at whatever pace I wanted. This chore allowed me to have some control over my situation. Drawing pictures in the grass allowed me to see that creating momentum can be done with odd jobs. The momentum I was building pushed me all the way through the summer. When I threw myself into whatever I was doing, people caught on and joined in. For example, one of my favorite activities at camp was dancing; several songs had a good beat to jump to. With a broken ankle, jumping was not quite possible. However, after several weeks of crutching around on my right leg, it became pretty strong. Toward the end of the summer, some of the middle school campers seemed “too cool” to dance to my favorite song, so I took the opportunity and jumped up and down on one leg. Seeing a person with a broken ankle jumping up and down was probably pretty funny and took the pressure off. The “too cool” for school middle schoolers joined in the dancing and jumping. My energy was contagious. Sometimes we have to fall facedown so we can know its possible to get back up. If I hadn’t been deterred by a broken ankle, I might still believe that I can only be helpful or useful if I am physically doing something. I might still be underestimating the power I have just being myself and relying on my natural talents. Activator is so powerful because it can be manifested in so many different ways, and only requires that we be all in. Activators can be catalysts for change. They can create the mood of a room, or the attitude of a group. The new mood can positively effect job performance, happiness and efficiency. When we’re aware of our Activator, it becomes even more potent and easy to use to our advantage. If Activator is dominant for you, consider the power you have if you consciously use it more often. Diversify the ways you use it. I’m finding new ways to activate my Activator in my career. I’m putting myself out there when meeting people who I look up to. I’m taking that first step to introduce myself to them. 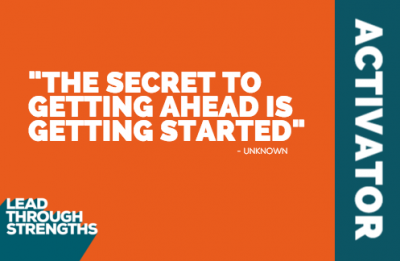 As a writer, I can be subject to writer’s block, which I have found is often alleviated by making an effort to start. So I’m making bigger efforts to tackle writing projects I know will give me a bit of trouble. – Speak out in meetings and take on a project! Your energy will create momentum. You will make things happen. – Pair up with someone who has a lot of ideas but may not know where to start. You naturally see first steps. You will feel not only accomplished and useful, but you will have helped someone jumpstart their career or project! – Identify trigger environments where you feel your Activator is most satisfied, and where it is most unsatisfied. Part of strengthening our talents is knowing where they show up so you can spend more time there.